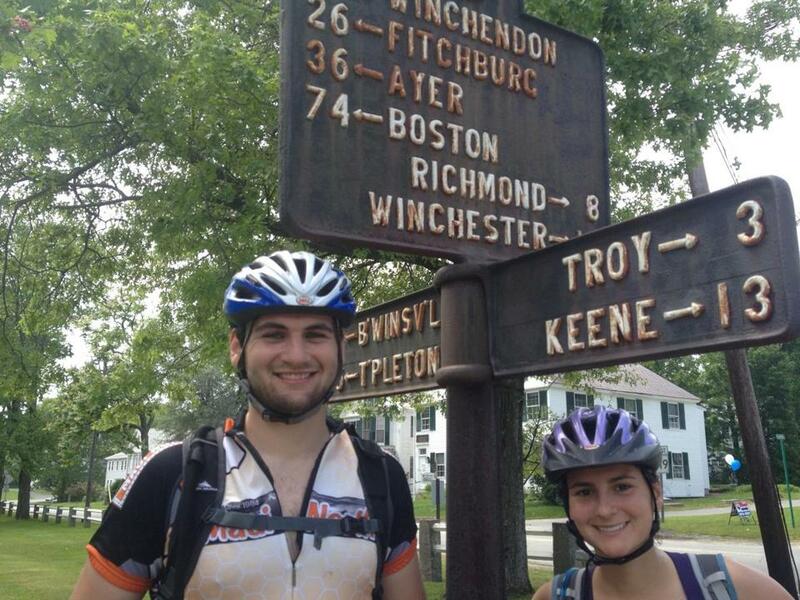 Cycling siblings Tom and Laura DiNardo on the final day in Fitzwilliam, N.H., where the family noted the first sign for Boston. MONTREAL — Mount Horrid certainly lived up to its name. We climbed it on the fifth day of our weeklong, 400-mile cycling trip last May from Montreal to Boston. To that point, the ride had been spectacular, everything I’d hoped for when I suggested it to my wife and two college-age children over the winter. Montreal, where my son, Tom, attends college, is one of the top biking cities in the world, the epicenter of 3,000 miles of cycling trails in Quebec known as Route Verte, or the Green Route. From the cornfields of southern Quebec, through the farmlands and lakefront of Vermont’s Champlain Islands, to the bustle of Burlington and the college-town charm of Middlebury, the riding was easy, and the scenery sublime. I’d dreamed of a long-distance bike ride since high school, but aside from day trips that almost always ended at ice cream stands, never rode more than 100 miles. After marriage, then children, vacations evolved into pleasant weeklong stays by beaches or lakes, governed by the unforgiving but predictable school schedule. As chief organizer, I didn’t have to do much persuading or consulting; I knew what my wife, Patrice, and I liked; we learned what worked with the kids; and habits formed. But with college classes, summer jobs, and young adult opinions to consider, a new approach was needed. I broached the idea of a long-distance bike ride to Tom, who couldn’t help but catch the cycling bug in bike-happy Montreal, and he signed on. My daughter, Laura, a strong athlete and an even stronger-minded individual, asked to join us, and another piece fell into place. If you go from Montreal to Boston by bike. Then Patrice — a lover of the outdoors and adventure, but not the world’s most avid cyclist — volunteered to be the support driver and advance scout for food and shelter. Suddenly, we’d solved our thorny gear and logistical issues and transformed a solitary trip into an unforgettable family outing. That still left Mount Horrid. We’d wheeled into Middlebury at midafternoon the day before. The overcast skies of the previous few days burned off, and the town was all blue skies and red brick. Patrice secured a huge room at the historic Middlebury Inn, built in 1827 and a dominant presence on the town’s Court Square. After a shower, we walked across the Otter River to tour the campus of Middlebury College, which was gearing up for graduation later that week, and the small but lively downtown. We had quickly fallen into the habit of finding the local bike shop at every stop on the trip, and consulting with cyclists there on the next day’s ride; invariably, they suggested better directions than the route I’d plotted. This time, we were told there was only one way across the Green Mountains — Brandon Gap, the southernmost of the passes across the national forest. I’d favored the Middlebury Gap, mostly for the scenery, but learned the roads were bad, and Brandon was the easiest way across. If that’s true, I don’t ever want to try the hard way. We were up and out of the hotel at 7:30. The men went to fuel up on eggs and bacon at Steve’s Park Diner, catty corner across Court Square; the women headed to a coffeehouse. With two vegans and two carnivores in the family, the trip could easily have turned into a culinary nightmare. But Vermont is nothing if not solicitous to vegans; there were plenty of animal-free options along the way. We rode south for a relatively flat 16 miles before turning east on Route 73 and heading up into the Green Mountain National Forest. Tom and I had ridden the Kancamagus Highway in New Hampshire, and I thought we knew hills. But Brandon Gap was steep and densely wooded, with no expansive views to divert the mind. When the signs helpfully noted we were on a 12 percent grade, I made the mistake of looking up. I still had a few hundred yards to go — but my legs refused to pedal further and I hopped off the bike while my younger, stronger riding partners powered on to the top. There were still 200 miles to go, but we’d faced our biggest challenge. It was all downhill from there — literally. Two hours later, we reached our day’s destination, Killington. May, as it turned out, is a great time to see Vermont: The leaf-peeping and snow-seeking crowds are nowhere to be found; hotel rooms are in ample supply; and shop owners are happy to stop and chat. While half the town of Killington was closed, several restaurants were open. Seeking a place where we could all eat dinner together, I asked a resident if there were any good vegetarian restaurants around. “What do vegetarians eat?” he asked sincerely. We opted for Italian. At other stops, the food was unforgettable. Maybe it was the riding, and all the calories we burned; maybe it was Vermont. But from the very first croissant we ate at our starting point, the Maison des Cyclistes across from Montreal’s Parc Lafontaine, we found so many gems along the route that we might actually have gained weight. Our first night’s stay, at the Ransom Bay Inn and Restaurant in tiny Alburgh, Vt., set the tone. The inn is a restored 18th-century stagecoach stop, owned by the hospitable Rick and Loraine Walker, who say that about 60 percent of their guests in good weather are cyclo-tourists. While there, we shared our table with a Quebec couple who were cycling the trails around Lake Champlain in preparation for a bike trip to Cuba. The Walkers also came to the rescue during our only mechanical malfunction on the trip. Tom noticed that his spoke was broken as we rode away from the inn, headed south on the Champlain Bikeway. The innkeepers helpfully called around and located a bike shop that could help — 30 miles away, in Plattsburgh, N.Y., on the wrong side of Lake Champlain. But since we had a support driver, a major headache became a minor inconvenience. While Laura and I pedaled south along the lakefront through the farmlands of North Hero Island, my wife and son drove off, repaired his bike, and rejoined the route at lunch, 20 miles down the road. Burlington was so enticing — and the weather so threatening — we spent two nights there. As we found leaving Montreal, approaching and departing large urban areas can be tricky. Both cities had well-marked bike routes to get you in and out of town with minimal interaction with traffic, but you have to pay attention; they zig and zag often. For the vegans and the meat-eaters among us, Burlington was a food paradise. We sampled the ciders and burgers at the Farmhouse Tap & Grill, the local eggs and bacon at The Skinny Pancake, two kinds of steak — cauliflower and beef — at Leunig’s Bistro, and Tom and I even tried in vain to split the bucketful of ice cream known as a Vermonster at Ben & Jerry’s. In Vergennes, a pretty little city south of Burlington, we followed some fellow cyclists and found the 3 Squares Cafe for lunch. The menu was well-stocked for vegans and carnivores alike; the tweet from that afternoon — “Cheese on my BLT! Gotta love Vermont.” — says it all. On day 5 we found ourselves in Chester, Vt., an artsy little town reminiscent of Oak Bluffs and its Victorian cottages. The Moon Dog Cafe there boasted a well-stocked juice bar, vegan soups, and salads. And in Brattleboro, on our final night on the road, Patrice found a great Mayan restaurant, Three Stones, that served classic Mexican food with and without meat. South of Killington, the final leg of the Vermont portion of the trip gradually descended to Brattleboro along Route 100, one of the state’s most scenic roads. The ride was easy and beautiful, but sad; poignant reminders of the destruction of Hurricane Irene were everywhere. “Please keep out, Irene already robbed us,” a sign on one boarded-up, broken-down house pleaded. Our last day initially was intended to take two. But with rain stalling us in Vermont, and the real world calling, we voted to make one final push from Brattleboro and try to cover the remaining hundred miles in one shot. It was the right choice. Route 119 in New Hampshire is hilly and gritty, showing off few of the many charms of the state. But crossing into Massachusetts, our pace quickened and the landscape softened. We entered the state through Willard Brook State Forest in Ashby, then passed through such rural gems as Townsend, Groton, and Forge Village. And since, remember, no long-distance bike ride is complete without ice cream, we ate our final meal at Kimball Farm in Westford. What once was a quaint side-of-the-road farm and ice cream stand has morphed into a carnival complex of driving range, volleyball courts, mini-golf, and barbecue grills. But the ice cream remains first rate, even if I can no longer finish a giant Kimball Special on my own. A late lunch of meaty lobster rolls and a strawberry ice cream sundae propelled us the final 25 miles home along the Minuteman Bikeway and the Charles River in the soft May twilight. Bennie DiNardo can be reached at dinardo@globe.com. Read the Twitter feed of the trip @DfamTourdeNE12.